Carrot recipes are very nutritious and easy to prepare healthy recipes. This recipe here is a easy Indian vegetarian recipe called poriyal in South India and carrot sabzi in north India. 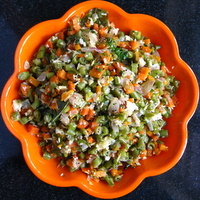 It is a very simple and flavorsome recipe. Carrots can be used to make salads as well as desserts. Find below some recipes. Heat oil in a kadai or deep pan (non stick is best), add the mustard seeds and allow to sputter. Add the urad dal (keep the heat low), as soon as they turn pink, add the ginger and saute for 30 seconds, then add the onion, curry leaves and chili. Saute till the onions become glassy (no need to caramelize). Add the carrots, beans and salt (no water). Cover with lid and let it simmer till just tender. When done sprinkle with grated coconut and coriander. This recipe should be dry, hence no need to add any water, the vegetables will get cooked in there own water. 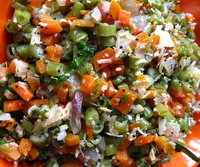 Although do give an occasional stir, so as to avoid the veggies getting stuck at the bottom of the pan. Serve as a side dish with chapati or rice.